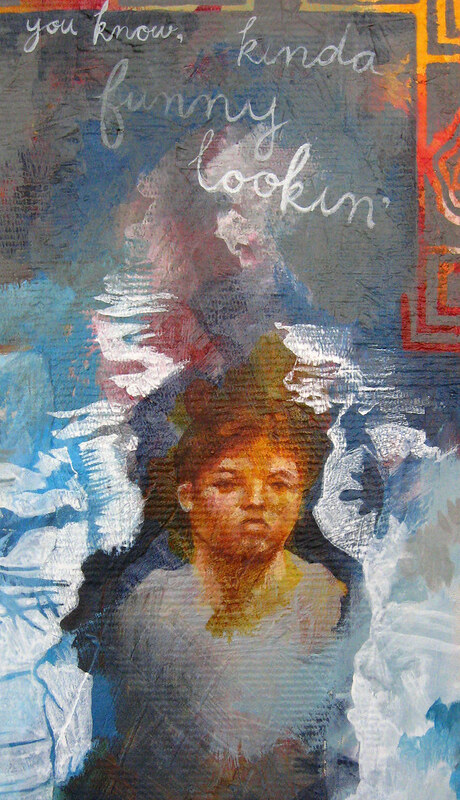 Iron, mixed media on cardboard, 6 x 8 inches, 2007 by Sarah Atlee. Some rights reserved. I made this collage sketch in preparation for the Signs portion of the Normal, OK exhibit in 2008. See more of these collages in this Flickr set. Revisiting my older works is a great way for me to take a look at the journey I've taken over the years. I'd like to share some works from the archives here that might not be featured in the Images section of this site. Watch for these in the coming weeks. Wedding Portrait of Madam Himmelblau, oil on panel, 2005 by Carrie Ann Baade. Click image to view source. This painting is from the Secret Lives of Portraits series. The spark of the muse that could be called intuition is present when I make the collage for my work. I begin this process by covering the first floor of my house in photos and ripped out pages from books. After the floor is covered I walk around looking for images that fell on top of each other in an interesting manner…this is similar to reading tealeaves. Often I will have a question in mind while diving into the piles of picture images, such as, “What can I say about the horrors of dating in Tallahassee.” This process reminds me of reading tarot cards and getting an answer through the cards that can sometimes be uncannily accurate. Looking for the divine spark to speak to me through these images, I collect and adhere together with cellophane tape to paint later. I know something is really working if I involuntarily laugh aloud at the juxtaposition. I feel the same intuitive connectivity when I'm making collage sketches. Sometimes the best compositions happen by accident, because I left two scraps in the same pile. I look over and realize, with a little rush of adrenaline, "Of course those go together!" Ostrich, collage sketch, 2007 by Sarah Atlee. Click image to view source. I like how Baade allows the collage aesthetic to show through in her finished paintings, without her images appearing slapped-together. She does an excellent job of creating integrated compostitions from a variety of sources. The world is a vast grab-bag of information, and our job as artists is to interpret, reinterpret, and dis-cover meaning through our medium. Although Baade has been told that "paint was an inadequate media to display the complexity of [her] ideas," her intricate creations overflow with narrative and emotion. You can explore more of Carrie Ann Baade's work here. As I was reading this interview on the Hi Fructose blog, I felt an eerie similarity between Baade's collage process and my own. This feeling was redoubled when I saw the previous blog post about the release of Isabel Samaras' new monograph by Chronicle books. The gent on the cover bears an uncanny resemblance to this guy here. The similarity is a coincidence. Sketch for How May I?, mixed media collage on paper. Click image to view on Flickr. For about ten years now I have collected pictures to use as ideas for new pictures. * I often start a painting by gathering a small pile of image sources, either intuitively, because they seem to go together, or for a specific purpose. I used to create a pencil-and-paper sketch of these various sources, attempting to synthesize them visually before starting the painting. I would also scan them, resize them, struggle through PhotoShop layers to get them to fit together just right. At some point I thought, "what I really want is this head on that body," and went: rip, slap, tape, done. I realized that the collage is visual shorthand for my pictorial plan. It didn't have to make sense compositionally; the collage is a convenient way for me to gather a group of visual sources onto a single page. Plus, the faster I make the collage, the more unexpected and interesting visual moments show up in the result. I've scanned a bunch of these collages and uploaded them to this Flickr set. Enjoy. *Old-school illustrators call this a swipe file. Though it was years before I learned that what I was doing was a traditional practice; before then I thought I was (gasp) stealing and that it was (gasp) wrong. Thank you, illustration.